Dogs of all ages need to be active to stay healthy. Therefore it's very important to provide our pets with regular playtime and exercise. Automatic ball launchers can provide dogs of all sizes the ability to play fetch to their heart’s content and stay active. These products can provide hours of fun and activity for dogs and their masters. One more important benefit that comes with ball launchers is that they provide dogs with not just physical activity, but also with mental stimulation as they learn how to play with the ball launcher. As a matter of fact, many Amazon customers who have used these products have reported that, after a while, their dogs lerned how to place the ball themselves into the ball lauincher and kept playing by themselves to their heart's content! Before you let your dog play with a ball launcher, be sure you have plenty of room for your dog to chase the ball. Though most ball launchers advertise their products as usable both outdoors and indoors, indoors use is only recommended at the owners’ discretion. You should first clear away any obstacles that could get in the way of your dog playing. You should definitely not use a ball launcher near delicate or breakable items, and do not use it on a surface that could potentially be damaged. This article will compare iFetch, iFetch and PetSafe automatic ball launchers for dogs. These were the most popular among Amazon customers at the time this article was written. Selected Automatic Ball Launchers for Dogs on Amazon. iFetch: You can use your iFetch while plugged in using the provided AC adapter/cord or on battery power. When batteries are used 6 C batteries (not included) are required. There is no rechargeable battery with this product. iFetch Too: It comes with a battery charger for the built-in rechargeable battery. 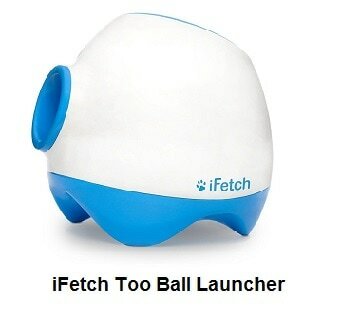 Your iFetch Too will keep throwing balls for approximately 250 launches on a fully charged battery. When you press the button on the rear of the unit to turn it ON, the button light will illuminate to indicate the battery charge level. iFetch: Uses miniature tennis balls that are 1.5" (41 mm) in diameter. Not full-size tennis balls! iFetch Too: The balls are felted like tennis balls, but made for dogs and are non-abrasive on their teeth. Standard tennis balls work also great, and any ball about that size normally should work. PetSafe: Uses standard tennis balls. On low settings 1 to 4, three tennis balls will fit into the hopper with no problem. On higher settings 5 to 9, it is best to use one ball at a time. Three balls may be placed into the hopper on higher settings, however, the balls in waiting may be knocked out. ​​- When one light is lit, it will launch approximately 10 ft.
- When two lights are lit, it will launch approximately 20 ft.
- When three lights are lit, it will launch approximately 30 ft.
​The light(s) will turn off after about 30 seconds, but the iFetch will remain ON (in standby mode) until you or your pet drops another ball into the funnel. Launch distance may be affected by the condition of the ball (e.g., wet or dirty). - When two blue bights are lit, it will launch approximately 25 ft.
- When three blue bights are lit, it will launch approximately 40 ft.
- When one blue light is flashing randomly, the ball will be launched a random distance of somewhere between 10 ft. and 40 ft. The light(s) will turn off after about 30 seconds, but the iFetch Too will remain ON (in standby mode) until you or your pet drops another ball into the funnel. Launch distance may be effected by the condition of the ball (e.g., wet or dirty). - For 8-10 foot launch range, start with the launch distance knob all the way to the right. - Turning left, use the first 2 notches to reach 8-10 foot distance. - For 10-20 foot range, turning left, use the 3rd–5th notch. - For 20–25 foot range, turning left, use the 6th and 7th notch. ​- For 25 foot range or more, turning left, use the 8th and 9th notch. This is feature is offered by PetSafe only. There is a special knob called the paw knob that is used to set the launch angle. The ball launch angles range from 20 degrees to 45 degrees. To have the ball launched very high, you need to turn the paw knob all the way to the left. To have the ball launched lower to the ground, you will need to turn the paw knob all the way to the right. Note that at first use, the paw knob will be turned all the way to the right. ​There is a motion sensor on the front that protects dogs and people from launched balls up to 7 feet away from the launch pocket. If motion is detected, the sensor will stop the launch for 5 seconds until motion is no longer detected. For this reason, you should not be walking or standing in front of the unit, if your intention is to launch a ball. You should also train your dog to stand to the side or 7 feet away from the front of the launch area. There is also a sensor in the launch pocket that detects foreign objects in the launch pocket and stops the launch. When a standard tennis ball is detected in the launch pocket, a tone will play. If nothing is in the way of the motion sensor, the ball will launch. If something is in the way of the motion sensor, a 1 second tone will play, alerting the user there is a disturbance. After 5 seconds, the ball will launch if there are no more disturbances. This is feature is offered by PetSafe only. The purpose of the automatic sleep mode is to make sure dogs get some rest. It is a safety feature to ensure that your dogs will not over-work themselves because it is very easy for dogs, and especially younger dogs, to play without realizing they need to rest. The unit will let the dog and person know when it will go to sleep for 15-minutes by emitting a 2-tone sound. It will restart and emit the 2-tone sound in reverse, meaning It’s play time again! In sleep mode, the LED light becomes orange and lights on every 10 seconds. To override the rest mode turn the unit OFF (with the power button) for at least 10 seconds and then turn the unit ON. If the unit is still in rest mode, turn the unit OFF again, wait a longer time and turn the unit ON. Ball Detection and Launch: 6 tone melody. Power On / Play Time: 2 tones (low/high). Power Off / Rest Time: 2 tones (high/low). Error: 3 tones of the same note. ​Motion Detection Delay Activation: 1 second tone. Plug the power cord into the back of the unit, and plug the adapter into the wall. For battery operation: open the compartment at the bottom of the unit and install 6 C batteries (not included) . Press the button on the back of the unit to turn the unit ON. Drop one ball in (insert only one ball at a time into the iFetch funnel). To increase the launch distance, press the button to cycle through the three distance settings. Your iFetch launch mechanism will quickly start spinning. Once the launch mechanism has reached its operating speed, the ball will drop into the chute and will continue spinning until the ball is ejected. After the ball is launched, the launch mechanism will quickly slow and stop spinning. Readjust the position of your iFetch as needed. Use with supervision and watch to ensure your iFetch is upright and functioning properly. Make sure the built-in battery is charged. - Down (white): Limits launching to only the low distance setting. - Up (red); Allows for any launch distance setting. Press the button on the rear of the unit to turn the unit ON. The button light will illuminate to indicate the battery charge level. One arrow light will turn on blue and the launch distance will approximately be 10 ft. (3 m). To increase the launch distance, first slide the High–Low slider up (if necessary), then press the button to cycle through the three distance settings. 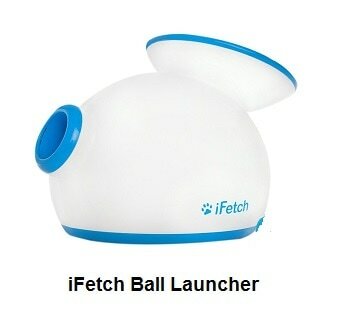 Insert one ball at a time into the iFetch Too funnel. The launch mechanism will quickly start spinning. Once the launch mechanism has reached its operating speed, the ball will drop into the chute and will continue spinning until the ball is ejected. After the ball is launched the launch mechanism will quickly slow and stop spinning. Readjust the position of your iFetch Too as needed. For battery operation, install 6 D alkaline batteries (not included) into the battery compartment, located at the bottom of the launcher. Otherwise, use the power cord/adapter that is provided as a way to power the unit. Turn the unit on: It will beep twice. Place one ball in the unit (do not place other objects! ). ​- To change the distance adjust the distance knob by pulling the knob out and turning. The angles range from 20 degrees to 45 degrees. To have the ball launched very high, turn the angle knob all the way to the left. To have the ball launched lower to the ground, turn the angle knob all the way to the right. At first use, the angle knob will be turned all the way to the right. - ​To increase the angle of the launched ball, pull and turn the angle knob counter clockwise or left. To increase the distance of the launched ball, pull and turn the distance knob counter clockwise or left. The distance ranges from 8 feet to 30 feet. ​So which of the three ball launchers to buy? The three automatic ball launchers considered here were the most popular in their category at the time this article was written, but they present some important differences you should keep in mind before you select the one that will best suit you and your pet. Note that some dogs will adapt quickly to the ball launcher and start pretty soon to have fun with it, while others will require some training and a learning curve before they are at easy and get the hang of it. But once they understand that it's for fun and play, they are a joy to watch as they wait, filled with anticipation, for the ball to launch. And, as mentioned above, once they start loving it, they may even start playing by themselves, fetching each time the ball and dropping it back into the launcher for the next launch! As a matter of fact, it is recommended that you begin training your dog to return the ball to the inside of the ball launcher upon retrieval of the ball. Once you and your pet get the hang of it, you will find your ball launcher to be unique, and that it can provide so much more fun than your everyday dog toy! Of the three ball launchers considered here, only iFetch Too has a rechargeable battery. Therefore, it can be taken outdoors anywhere without having to spend for any batteries. It comes with a charger. 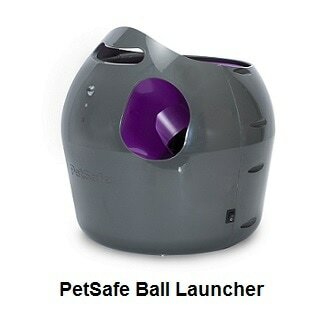 The other two ball launchers (iFect and PetSafe) can be used either plugged using the included power cord and adapter or with non-rechargeable batteries that you will need to buy. While iFetch Too can launch a ball the highest (about 40 ft.), with PetSafe you can adjust both the height and the angle of the launch. Only PetSafe is equipped with a motion sensor to prevent your dog or anyone from being hit by the ball if they stand closer than 7 feet from the ball launcher. And only PetSafe has a ​sensor in the launch pocket that detects foreign objects in the launch pocket and stops the launch (see Note 5 above for details). Only PetSafe has the automatic sleep mode to make sure dogs get some rest (see Note 6 above for details). Note that certain users with very active dogs found this feature to be a nuisance as it interfered with their dog's having prolonged activity. Note however that the it is possible to override the sleep mode as described in Note 6 above. Only PetSafe emits audible tones to inform you of errors or different states the launcher might be in (see Note 7 above). Note that there is also a 30-Day return policy with all three ball launchers considered here, if the product is deemed to be faulty. Please click the ball launcher of your choice below for price information or to purchase. ​Do you also have one or more cats at home? If you have cats in your home, and you want them to have a lot of fun while they exercise and stay healthy, you might want to read the following article: Compare Best Cat Play & Exercise Accessories.